Background This Phase Ib trial assessed the maximum tolerated dose (MTD) and safety of the Toll-like receptor 9 agonist IMO-2055 combined with 5-fluorouracil, cisplatin, and cetuximab (PFE) as first-line palliative treatment in patients with relapsed and/or metastatic squamous cell carcinoma of the head and neck (R/M SCCHN). Methods A standard 3 + 3 study design was used. Patients were sequentially enrolled to be treated with IMO-2055 (0.16, 0.32, or 0.48 mg/kg/day; days 1, 8, 15), 5-fluorouracil (1,000 mg/m2/day; days 1–4), cisplatin (100 mg/m2/day; day 1) and cetuximab (400 mg/m2/day first dose; then 250 mg/m2/day; days 1, 8, 15) every 3 weeks. Results Thirteen patients received IMO-2055. Dose-limiting toxicities (DLTs; ie, any Grade [G]3/4 treatment-related adverse events [TEAEs] in cycle 1) occurred in 2/4 patients treated with IMO-2055 0.32 mg/kg (G4 hypokalemia and hypomagnesemia [n = 1]; G4 septicemia, hyperthermia, febrile neutropenia, and G3 hypotension [n = 1]). In the IMO-2055 0.16-mg/kg expansion cohort, 1 patient experienced DLTs of G3 sepsis, bacteremia, and hyperthermia. The most common G ≥ 3 TEAEs were neutropenia (n = 9; not including febrile neutropenia [n = 1]), hypokalemia (n = 5), and hypomagnesemia (n = 4). Serious adverse events (SAEs) occurred in 8 patients, including 4 with SAEs considered IMO-2055 related; 1 of these patients died. Best response achieved overall was partial response in 3 patients and stable disease in 9 patients. The overall safety profile led to early trial termination; the safety monitoring committee did not confirm the MTD (formally IMO-2055 0.16 mg/kg). Conclusions Regimens combining IMO-2055 and PFE cannot be recommended for further development in R/M SCCHN patients. The authors would like to thank patients, investigators, co-investigators, and the study teams at each of the participating centers and at Merck KGaA, Darmstadt, Germany, and Merck Serono SA – Geneva, Switzerland (an affiliate of Merck KGaA, Darmstadt, Germany). 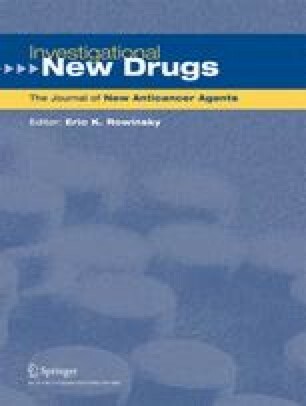 Editorial and medical writing support in the preparation of this manuscript was provided by Marianne Eyholzer, PhD, TRM Oncology, The Hague, The Netherlands, funded by Merck KGaA, Darmstadt, Germany. The clinical trial was sponsored by Merck KGaA, Darmstadt, Germany. This clinical trial was conducted in compliance with the clinical trial protocol, the Declaration of Helsinki, the International Conference on Harmonization guidelines for Good Clinical Practice (ICH Topic E6, 1996), and applicable regulatory requirements. Informed consent was obtained from all patients prior to their inclusion into the trial. JP Machiels, MC Kaminsky, and JP Delord declare that they have no conflict of interest. U Keller and TH Brümmendorf are members of the advisory board and speakers for Merck KGaA, Darmstadt, Germany. T Goddemeier is an employee of Merck KGaA, Darmstadt, Germany. U Forssmann is an employee of Merck Serono SA – Geneva, Switzerland (a branch of Merck Serono SA, Coinsins, Switzerland, an affiliate of Merck KGaA, Darmstadt, Germany).